Friday night was the night I promised we could go back out and actually spend the gift card Nathan got for his birthday. You may recall that for Ben's birthday, our youngest son generously offered to split his birthday gift card with Nathan. So this time it was Nathan's turn to return the favor and split his card with Ben. 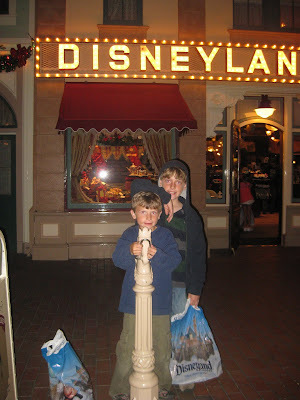 When we went to pay for their goodies, we discovered that until January 3rd, Disneyland is actually offering ALL Annual Passholders the 10% merchandise discount that only the top tier of Passholders normally get. Which basically covers the tax... but still, it was a nice gesture on Disney's part! We didn't go on a single ride, and it was the very first time I've ever seen my boys get excited about shopping!